This is one of my most exciting Summer research projects - I am building a Delta style 3D printer which I will outfit to extrude ceramic paste. The LSU School of Art has supplied funding for this endeavor with the agreement that they get to keep the printer when I am finished. The knowledge I will gain in building this machine, however, will be invaluable (plus, I get to use the printer as much as I want). The printer I am making has already been designed and built in a number of iterations, and by more than one person. These are just a few of the individuals whose work I will openly reference throughout this project: Jonathan Keep, Unfold Studio and Bryan Czibesz. There is also a Google Plus page that hosts a knowledgeable and friendly community of artists/designers pursuing research in ceramic 3D printers. Posts you find on this page will document my efforts to make this pile of parts into a working, paste extrusion 3D printer. I have two goals: to make this printer a reality for LSU students to utilize, and to build upon the research of those I am relying on throughout this endeavor. Without further ado. The majority of the parts for this printer are pre-manufactured and available on either Ebay or Amazon. 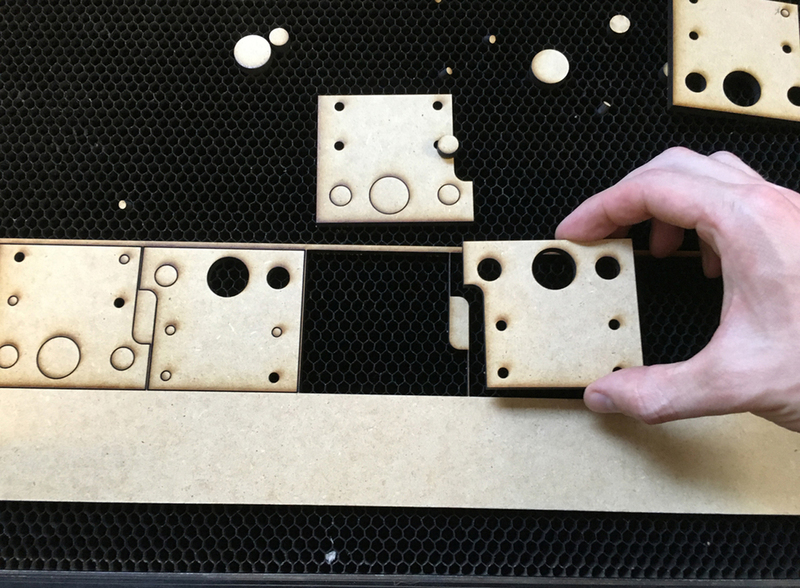 However, there are a hand full of components that must be either printed on a FDM printer, or cut out of MDF using either a CNC router or laser cutter. Our CNC router at LSU is currently out of commission with a replacement part on order, so, I decided to use our Universal Laser cutter to fabricate these components. 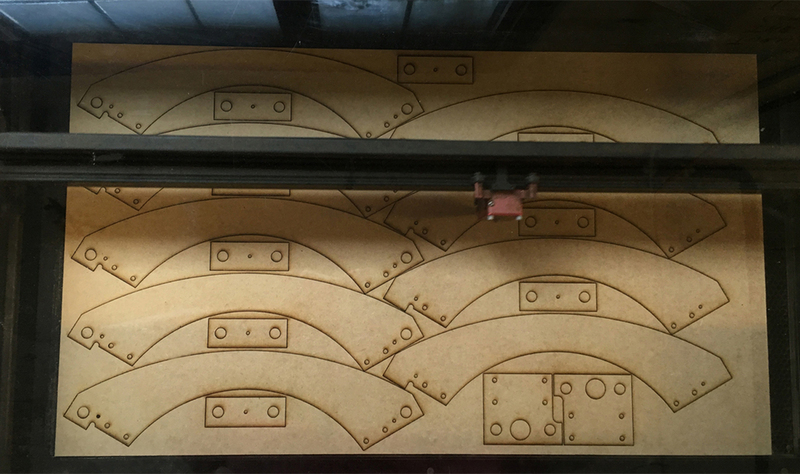 At this point, there were two obstacles to address, first, these laser cutters can only make cuts to 1/4" depth, and second, the final parts need to be 3/4" thick. So, my solution is to cut three layers for each part and use dowels as alignment pins in the holes when I glue them together. Another concern is that two of these parts contain holes which do not pass completely through the part. In order to achieve these partial holes, I deleted them in the third ply so that they will only exist in two of the three plys. Fingers crossed, I think this is going to work. This images includes the remainder of the parts, minus a few pieces of hardware. You can see everything from zipties to mechanical drive parts to extrusion and pneumatic fittings. Tomorrow, I will glue the laser cut plys together and begin assembly. It's exciting to see everything on the same table!